I will not deny that a study of history can indeed help us to avoid the mistakes of the past. The founders of the United States, for instance, were keen to avoid the descent of their republic into civil war, and its transformation into an empire – something that happened to Rome over the course of the first century BC. Among other things, the founders maintained a firm division between civilian and military life, with the latter firmly under control of the former. Thus, we have not yet had troops under the command of Nancy Pelosi take over Washington and slaughter the supporters of John Boehner, who in turn formed an alliance with Mitch McConnell in order to take it back, etc. But the whole issue of the Decline and Fall of the Roman Empire is immensely complex and deserves to be studied in depth. We should certainly resist glib answers that allow people to set themselves up as prophets of doom. For instance, I have been told by several people that Rome fell because God punished it for its toleration of homosexuality and other acts of moral turpitude. OK, but it fell after it converted to Christianity – so it’s the Christians who ran it into the ground, because their true home is in heaven, and what do they care about running an empire? (This was Gibbon’s original argument, if I recall correctly.) So we have two simplistic reasons, one from each end of the cultural spectrum, and suggesting that if we want to avoid the fate of Rome, we should either re-criminalize homosexuality, or double-down on state secularism. But rather than identifying some aspect of the late Roman experience, and finding the same thing happening today, and using it to offer up some ponderous “lesson of history” (other examples: imperial overstretch, uncontrolled immigration, “bread and circuses“, or even the lead pipes as metaphor for chemicals in the environment*), it is usually better to take a step back and consider whether the differences between Rome and America might not be more significant than the similarities. As Jack Hexter said, splitting is better than lumping! The biggest and most obvious difference between Rome Then and America Now is that the American economy is capitalist, and far more dynamic, expansive and robust than Rome’s ever was. There are problems with this situation, of course, and nothing lasts forever, but we can always put off the day of reckoning by creating debt, something the Romans could never do. * But not concrete, despite an article sent to me by a friend entitled “Downfall of the Roman Empire Caused by Concrete.” If you read it, you’ll discover that the researcher claims that Roman concrete “played a significant role in bringing down the Republic,” by allowing politicians to start building as though they were kings. 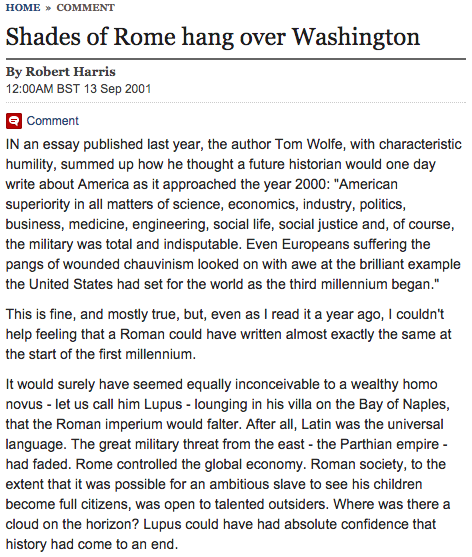 There was a time when even journalists knew the difference between the Roman Republic and the Roman Empire. This entry was posted in History, Uses of History, Western Civ. by jgood. Bookmark the permalink. Not in defense of the journalist, but the “Republic” was an empire, if not the Empire. Always annoying w/regard to these theories: ignoring the survival of the state in Constantinople. And, we’ll be hitting the fall of Western Roman & “Eastern” Han empires this Friday in my classes.